President Sam Hammond updated members of the Representative Council on the state of talks with the Wynne government. Thanking members for their contributions and hard work over the past year, he noted that the tone of discussions continues to be positive and that ETFO is working hard with the government to come to a concrete resolution. He also assured the Representative Council that any decision would be taken to an all member vote. Stay tuned to controlyourfuture.ca for the most up to date information. Special guest Trish Hennessy, Director of the Centre for Policy Alternatives Ontario Office, gave a presentation titled “The Case Against Austerity,” which considered the many reasons why the austerity agenda does not work. Honoré Théodore Ahimakin, Ambassador of Benin; Joan Littleford, former ETFO staff member and consultant on early childhood education; and Nina Valentic, Senior Director, International Programs, Right To Play International, spoke about ETFO’s important contribution to educating children internationally. 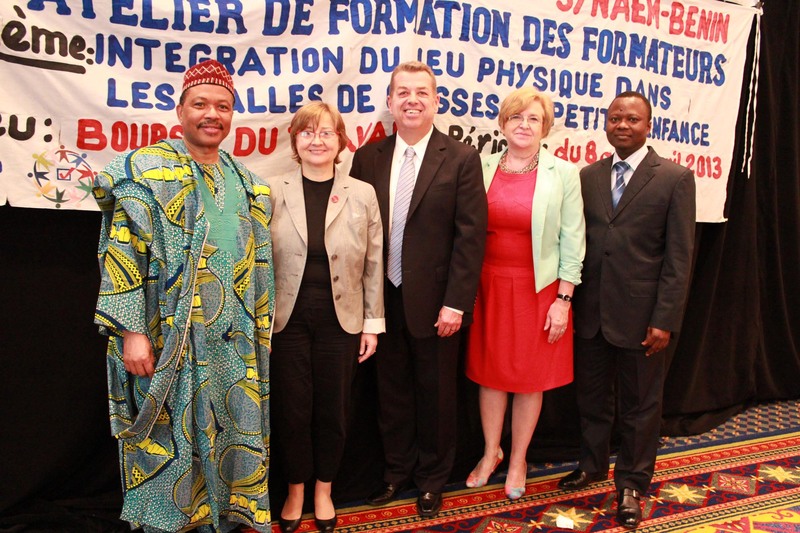 The ambassador gave a heartfelt thank you for the tremendous contribution ETFO has made in Benin. June 21 is National Aboriginal Day. This date was chosen because it corresponds to the summer solstice, the longest day of the year, and because for generations, many Aboriginal groups have celebrated their culture and heritage at this time of year. ETFO is a long-time ally of First Nations communities. We are proud to support the Lieutenant Governor’s Summer Literacy Camps in remote and northern communities, to sponsor the Right To Play Leadership Program and to support Shannon’s Dream and the community of Attawapiskat. Learn more at etfo.ca/advocacyandaction. Pride events are being held across the province between the months of June and September. There are more than 20 different events celebrating Pride in Ontario. Go to http://www.etfo.ca/AdvocacyandAction/SocialJusticeand-Equity/Pride for more information about participating or contact Adam Peer, ETFO Equity and Women’s Services: apeer@etfo.org. Emily Chan writes about how she collaborated with Indigenous artist Maria Hupfield and Jumblies Theatre to teach her students about treaties and Canada’s aboriginal and settler history.